Have you ever wondered about the Torah scroll with the flames – the one with the tapestry mantel? Have you noticed the word “Prague” appears at the bottom of the mantel? This Torah scroll is special. Not because it was written in 1900 or because it came from Turnov in what is now the Czech Republic. It is special because it survived the Nazi occupation and World War II. How did it find its way here? According to the Memorial Scrolls Trust web page at www.memorialscrollstrust.org : In November 1938 a vicious pogrom attacked 50 synagogues in Bohemia and Moravia and the majority of their contents were lost. The remaining 300 synagogues were abandoned. In 1942, a group from Prague’s Jewish community devised a way to bring religious treasures from the deserted communities and destroyed synagogues to the relative safety of Prague. More than 100,000 artifacts found their way to the Central Jewish Museum in Prague including about 1,800 Torah scrolls. The Museum’s staff recorded, labelled and documented each scroll on a card index with its place of origin. After the war, the scrolls were transferred to the ruined synagogue in Michle, a district of Prague. When fifty congregations re-established themselves after the war, the religious artifacts were given to those communities. In 1948, the Communists took over the government of Czechoslovakia. Jewish communal life was suppressed and most synagogues were closed and their possessions given to the newly refounded Jewish Museum of Prague. 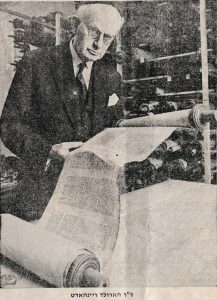 In 1963, Eric Estorick, a London art dealer, was offered 1,564 Torah scrolls from the Jewish Museum in Prague. Mr. Estorick contacted Ralph Yablon, one of his clients, who contacted Rabbi Harold Reinhart of the Westminster Synagogue (formerly the rabbi of our Congregation B’nai Israel from 1924-1930). Mr. Yablon and Rabbi Reinhart asked Chimen Abramsky, a Hebrew scholar, to go to Prague and examine the scrolls. Ultimately, the scrolls were acquired from the Artia (the Czechoslovak State Cultural Agency) for and transported to the Westminster Synagogue in 1964. The scrolls were from the provinces of Moravia and Bohemia and a few from the Sudetenland. 216 scrolls could not be traced to any particular community either because the original label was lost or there was no information on its origin. Most of the scrolls bore a card label with a number that referred to the original card index prepared by the curators at the Prague Museum. The original index accompanied the scrolls. The Memorial Scrolls Committee of Westminster Synagogue assumed responsibility for the scrolls. The scrolls were stored on wooden shelves built especially for them. These shelves were located on the second floor of Kent House, the home of the Westminster Synagogue (originally the home of Queen Victoria’s father). Through the vision of Rabbi Harold Reinhart, the administrative work of Ruth Shaffer, and the dedication of David Brand, the Trust’s sofer (scribe), each scroll was carefully unrolled, scrutinized and its condition recorded. Many scrolls were too badly damaged to be used again, but many merited a careful cleaning and restoration. Rabbi Reinhart obtained permission for David Brand to remain and work in Britain. Rabbi Rinehart found a small flat for Mr. Brand, and later arranged for Mr. Brand’s family in Jerusalem to join him in Britain. Mr. Brand, who was strictly Orthodox in his approach to Judaism, came from a line of professional sofers and had trained at a yeshiva in Paris before looking for work in Europe. For twenty-seven years, David Brand worked on the scrolls. When he first arrived, Mr. Brand spoke only Yiddish so Ruth Shaffer translated. Over time, Mr. Brand learned English and rapidly made himself at home in Kent House, valuing his new friends as they did him. When the work was nearly complete, Mr. Brand and his family returned to Jerusalem; Mr. Brand returned from time to time on special visits to Westminster Synagogue and his friends. The majority of the scrolls are now loaned out to communities throughout the world while a few are displayed as part of the Czech Memorial Scrolls Museum at the Westminster Synagogue. These scrolls are used in synagogue services of all kinds. This museum includes over 400 binders (the belt used to keep the rollers or Eitz together) making it one of the largest collections of this type. It is a permanent memorial to the martyrs from whose synagogues these binders came. Our Sefer Torah is MST Number 995. It arrived with a certificate of authenticity that hangs on the south wall of the room behind the Bima. It came from Turnov, in what is now the Czech Republic. It was written in 1900. The cover – or mantel – for the Turnov Torah Scroll was embroidered by Tim Marks, a member of Congregation B’nai Israel and a WWII flying ace. It was designed by local fabric artist named Vima. Currently, our Memorial Scroll is used at the annual confirmation service on Shavuot. The confirmation classes learn the story of MST No. 995, the Turnov Torah, during their training from Rabbi Mona Alfi. More information about the Memorial Scrolls Trust is available on their website at www.memorialscrollstrust.org. The oldest preserved tombs in the Jewish cemetery are from the 17th Century; the latest were added after World War II. The older tombstones inscriptions are in Hebrew; German inscriptions appear in the 1840s; and Czech inscriptions were used at the turn of the 19th Century. (From the Turnov Jewish Cemetery web page http://www.cesky-raj.info/dr-en/959-jewish-cemetery-in-turnov.html).